With the amount of rain we are receiving, it is not hard to see why in New England we call it mud season. The ground is no longer frozen, but the grass is not yet growing. It is very easy for cattle to make a muddy mess. 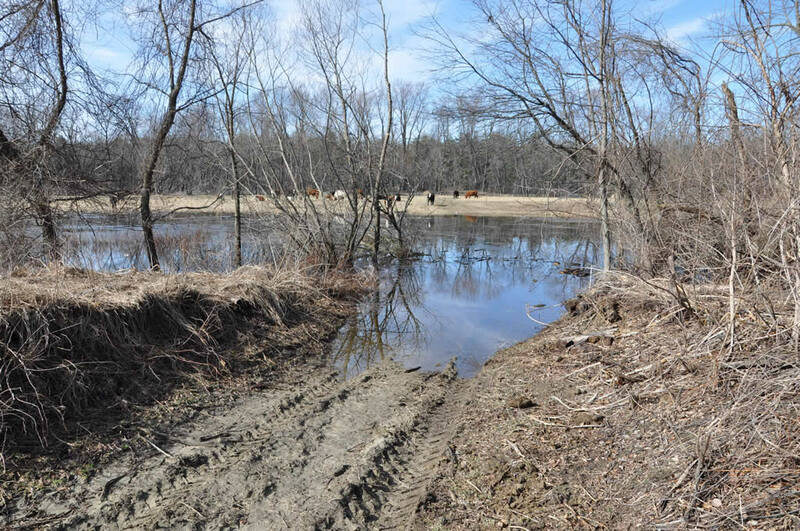 It is especially bad for us, because we get flooding from the Merrimack River and because our soil was heavily tilled during its years as a vegetable farm. In past mud seasons, I have used the common strategy of “sacrificing” one pasture. That is, I fed the animals hay in a single pasture for a month or two—allowing it to become a muddy mess and allowing the rest of the fields to grow back. This year, I am trying something different. I have scattered bales of hay over a large area, and I am moving the animals quickly to keep the soil from getting too damaged. This year we will reseed behind the cattle. In the future, we hope to build up a strong enough base of sod that will hold up under heavy hooves. I am back from my vacation to South Africa and Botswana. 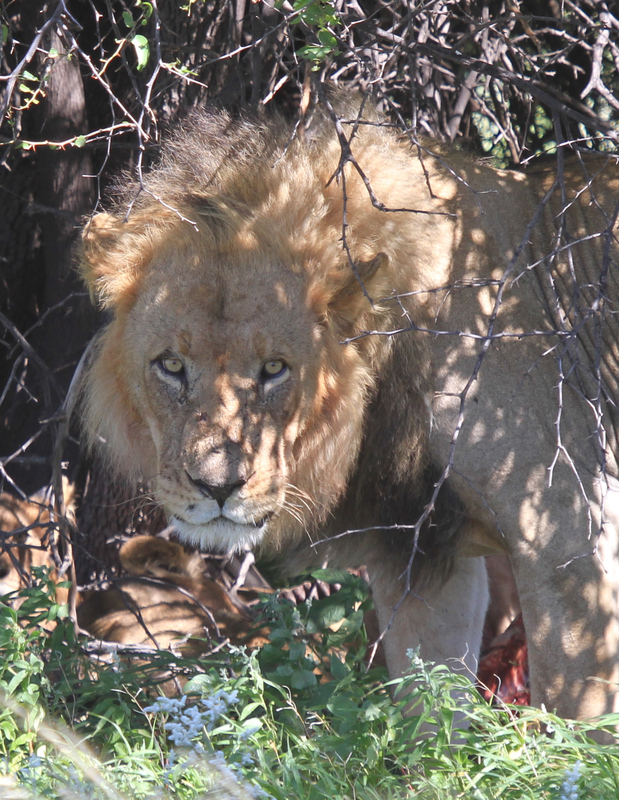 We had wonderful sightings of game including this lion and his pride feeding on an oryx kill. It was great to observe nature functioning like a well-oiled machine. Spring seems to have sprung earlier this year here, and I am ready to sink my teeth into the coming season. I have a full inbox of email, so please bear with me as I respond to all your messages. I’m counting the days now until Steve gets back from South Africa. The list of mishaps keeps growing. Today I discovered the electric fence had a short circuit. None of the cattle got out, though. They must like it here! Nevertheless, I fixed it. On the positive side, another healthy calf was born today. 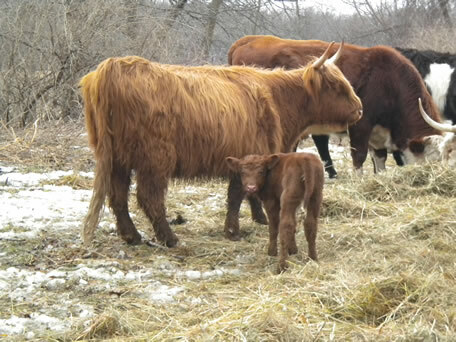 When Steve left on vacation, he told me this first-calf Highland heifer would be the first to give birth this year, but he expected the birth in mid-March. 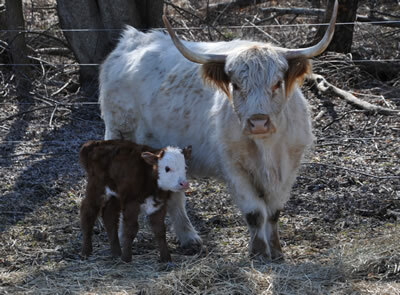 Imagine my surprise when the calf showed up yesterday! By pure coincidence, my go-to calf-birthing expert, Whitney Carpenter was on hand to pronounce the calf healthy and to calm my nerves. I keep thinking I need to DO something, but Whitney assures me otherwise. Mom is doing a great job all by herself.